Horses can run pretty fast. You know this already. But how would you fare trying to get up to speed next to a horse that was bred to do nothing but run really fast? Not well. But one hero wanted to know just how "not well" he would do against a race horse. 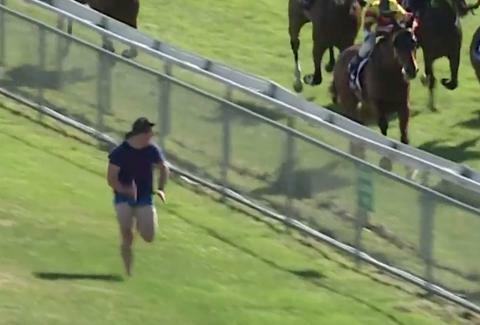 At a horse race in Australia over the weekend, the man lines himself up to get running alongside the horses down the stretch. He gave himself a bit of a head start, which seems fair since they horses are already cruising along, and then took off. It turns out, you look like you're running in Jello when juxtaposed with an incredibly fast animal. It's ridiculous. Though kudos to the announcer for keeping it together while this all takes place live. It'd be hard not to stop and say, "Oh, what the hell is going on here?" The horses catch and pass the running man like he's barely moving. Then, adding insult to injury, he injures himself. From the looks of it, he pulls his right hamstring while sadly trying to keep pace. Hopefully, he's treated better than a horse when they're injured in a race. Dustin Nelson is a News Writer with Thrillist. He holds a Guinness World Record but has never met the fingernail lady. He’s written for Sports Illustrated, Rolling Stone, Men’s Journal, The Rumpus, and other digital wonderlands. Follow him @dlukenelson.